I am so excited to be back here in this space writing and creating new recipes. It has been quite a break I admit. Mostly I have been occupied with school beginning and also work. I officially have no more pre-schoolers and I am so delighted to see my not so small children growing, developing and becoming more and more interesting by the day. In addition to my days being fuller and more intense I am also teaching three times a week and all that has to be timed pretty well and it has been challenging. As excited as I am about new beginnings it is very involved and stress can be a common state. I have been practicing a self-care routine lately and I started in the summer and one of my goals for the new school year was to just keep it up. I did some journaling but I haven’t managed to keep up with it on a daily basis but I have managed to maintain a regular meditation practice. Another key element being yoga and I haven’t been consistent with that either but I am trying to be kind to myself and just find pockets of time to really be aware of how I feel and make time to treat myself. That could be just a 20 minute session on my mat and I am good to go. It has never been so crucial for me as now because there are a lot of moments that can be overwhelming and end up in some kinds of conflicts. Blogging has also been on hold and I guess it is clear that kids come first. Once they are taken care of then I can sort out what time I have left and try to make the most of it. Its probably no surprise that I am cookbook hoarder and with the time I have become quite picky because I don’t like to clutter. If I have something in my space I want it to serve a purpose and I want to turn to it again and again for inspiration. So when I approach buying a new cookbook I really want it to offer me something new. This a difficult task I know. For all those cookbook authors out there, I really admire you all so much. There is nothing that I would love to do more at the moment than to write a cookbook. I guess it is also a great challenge and there is so much that needs to be considered but what I love most is learning new techniques of cooking simple things. That is what gets me really excited. Seemingly simple ingredients and yet with special attention they are turned into something magical. Special sauces and dips come in at a close second and so here I am with this new recipe and it looks like a lot of other similar salads but with magical differences. The magical book in question is by Joshua Macfadden and is called Six Seasons- a new way with vegetables. It is not a vegetarian cookbook but contains mostly recipes featuring vegetables. I especially like his farm to table approach and the detailed condiment section. For me the attention to detail in a recipe or approach is very important and makes all the difference. Yes, you can just boil a grain with water but adding aromatics or toasting the grain adds more depth of flavour and a more interesting texture. 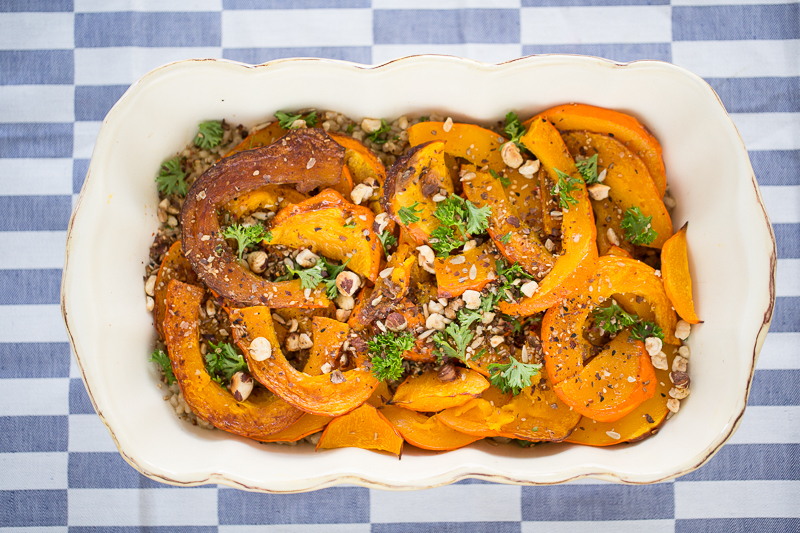 In this recipe I incorporated such a technique and decided to add some roasted hokkaido squash and dukkah to make a delicious fall-inspired grain salad. I encourage you to explore the same technique with other grains like barley or buckwheat and I know you will enjoy it. For those of you not familiar with dukkah, this is an Egyptian condiment used especially with olive oil and flatbread. I used the recipe from Ottolenghi’s Jerusalem. I will also include the recipe here below. The salad is straight forward and can also be made in advance. I prefer eating it within an hour of making it. The flavours get to marry and it is still lukewarm. I hope you enjoy this recipe and let me know how you liked it and also if you have special techniques for cooking grains. I am always curious about new techniques. Hoping to be back shortly with another fall recipe. Spread the hazelnuts on a baking tray and place in the oven for 20 minutes. Add the sunflower seeds after 10 minutes. Remove from the oven and cool while you toast the seeds. Heat a cast iron pot and toast the seeds individually all for about 30 seconds to one minute or until they start popping or become brown and fragrant. 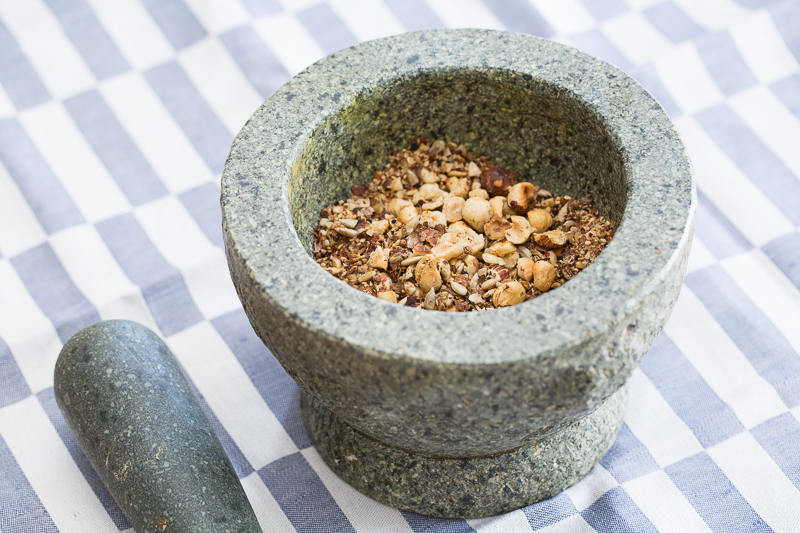 Using a pestle and mortar and coarsley chop the hazelnuts followed by the other seeds. Transfer them to a bowl and mix together. Store the dukkah in an airtight container for about a month. 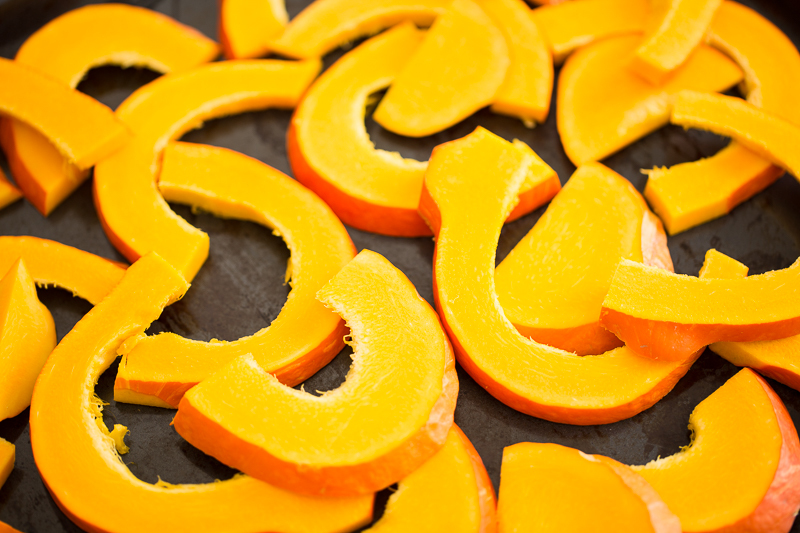 Increase the oven temperature to 200 °C and cut the hokkaido squash into wedges and place on a baking tray with space in between. Season with pepper, salt and olive oil and roast for 25 to 30 minutes or until the edges become nicely caramelized. Remove from the oven and set aside. Put a nice glug of olive oil into a large skillet that has a lid and heat over medium high. Add the smashed garlic and chili falkes and cook slowly to toast the garlic until golden brown. Add the farro and cook over medium heat, stirring more or less constantly so that the grains toast evenly, for about 3-5 minutes. They will darken and become fragrant. Add the water and the bay leaf and salt and bring to a boil. Cover, adjust the heat to a simmer and cook the farro until it is tender but hasn’t exploded. 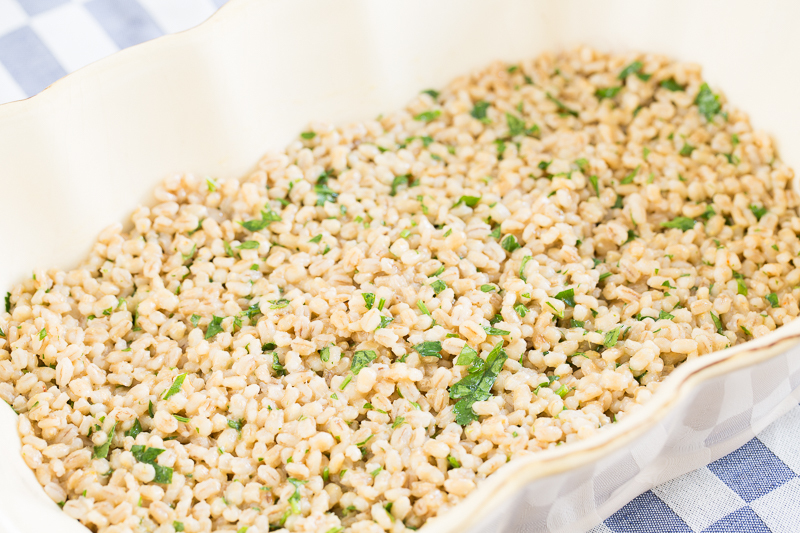 This can take 15-30 minutes depending on your farro. Drain the farro and transfer to a large bowl. For the dressing, combine all the ingredients in a jar and shake until smooth. Pour over the grain and the chopped parsley, leaving some parsley to garnish the salad with. 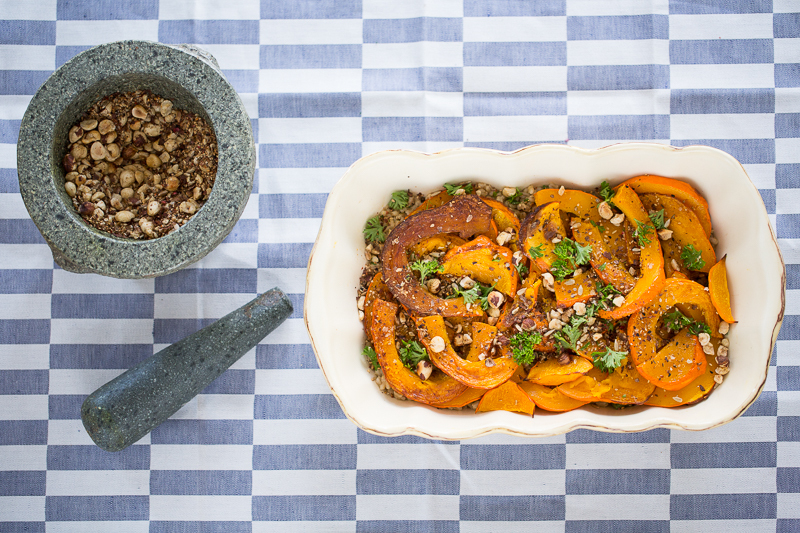 Top the farro with the hokkaido squash and a generous sprinkle of dukkah. Serve warm.